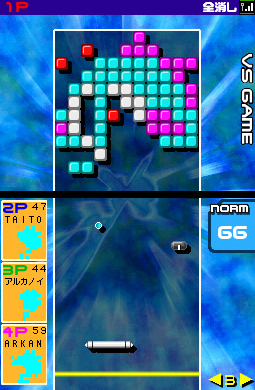 Arkanoid DS that isn't rubbish. 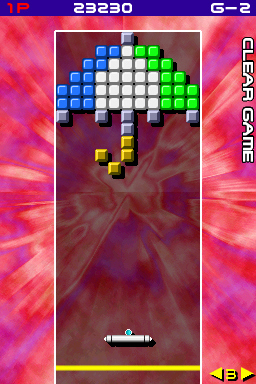 You've played Arkanoid DS, right? If so, sorry for bringing it up again. I know those wounds took some time to heal, and it's insensitive to raise the matter again so soon. But there's something you need to know. It's really not as soul-tearingly awful as you think. Don't get me wrong - for some reason beyond my imagining, it wants you to THINK it's awful. 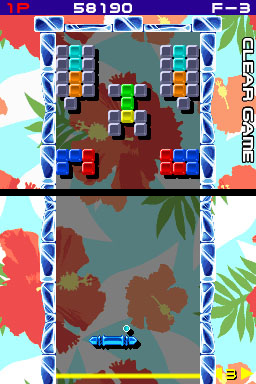 That's why it made all the bricks square, made the playfield so tall and narrow, filled so many of the levels with hateful, tedious walls of gold and silver bricks, and put a big dead zone across the DS's hinge just where the bricks start, so that for much of the time you'll find the ball appearing for a tiny split second on the top screen, hitting an indestructible gold brick, and then bouncing back into the dead zone where it's invisible, before you've had any amount of time to analyse its path and work out where it might emerge. 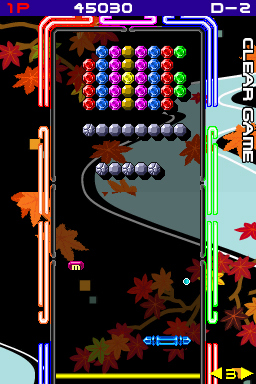 That the game does this sort of thing for so many hours certainly constitutes reasonable grounds for concluding that Taito hates you and deserves to be killed. 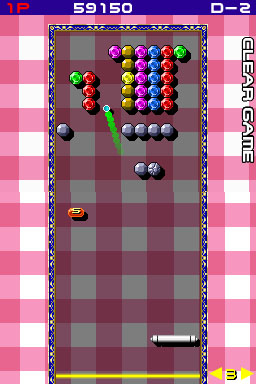 There have been few videogames ever created that are less enjoyable than the first five hours of Arkanoid DS. 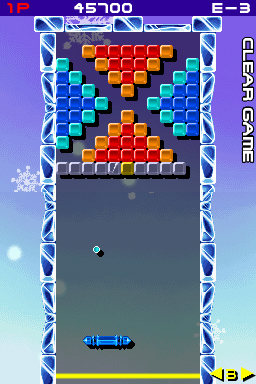 But Arkanoid DS has a secret. It's one it's only prepared to share with the most dedicated of fans, those who've proved their love by wading through all 28 zones and 145 miserable, awful rounds of tedious gold and silver hell. And it knows what it's been doing, too. Because when it knows that you've been infuriated and enraged past all normal human tolerance, it presents you with a game called Uranoid. WoS is not making that name up. 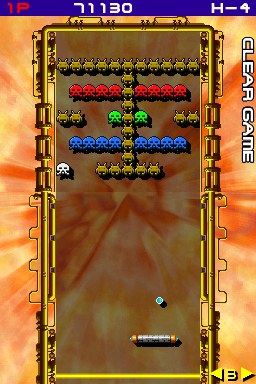 Uranoid is what Arkanoid DS should have been in the first place. 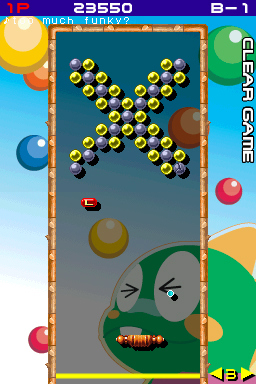 It's a linear 35-level run like the first two coin-ops, and almost entirely comprises pretty, well-designed, likeable stages. The levels are largely free of plagues of silver and gold bricks. 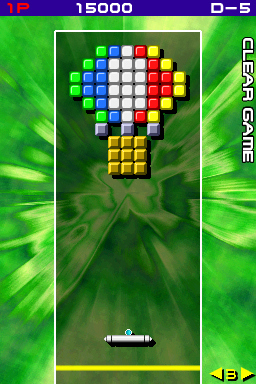 There's a clever and simple high-score mechanic, three different boss zones for replay value, and it's the most fun Arkanoid since Doh It Again on the SNES in 1997. 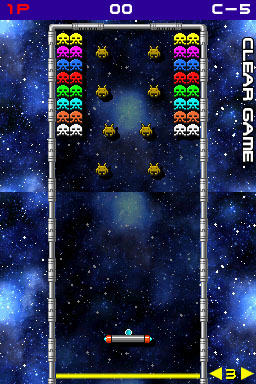 Uranoid is as good as the main game is bad, which is to say "very very". But WoS has never held any truck with the theory that players should be made to endure hours of drudgery in order to access a game's good bits, and there doesn't appear to be any kind of cheat mode that unlocks Uranoid from the start. Thank goodness, then, that we have the magic of videogame piracy. Because without piracy we wouldn't have flashcarts like the R4 and the TTDS, and without flashcarts WoS wouldn't have been able to do all the unpleasant, unjustifiable work for you and present you with an easy-to-use save file which opens up Uranoid at the click (or more accurately, the drag and drop) of a mouse. This is it here. This exclusive save file is WoS' gift to you, and also to the good people at Taito Inc. Because murdering people is wrong, no matter how reasonable and eminently justified it can sometimes seem. Enjoy Uranoid, viewers.